Homework and children living with ADHD are not always a good mix, but if you assist your child in developing diligent study habits and routines, your child will be set up for greater success outside of the classroom. Communication with your child's teacher is key. If your child is struggling to complete homework assignments, ask if the number of assignments can be lessened without compromising your child's education. If your child doesn't have to write down homework assignments in class, ask if the teacher could email you the directions or provide a list on the class website. Help your child stay organized with a simple 3-inch, D-ring binder that is divided into sections for each class. Give each subject its own folder in the binder, and include homework folders for "Homework to Be Done" and "Completed Homework" at the front of the binder. It is also helpful to maintain a detailed homework log to track when assignments are due and what materials are needed. A large calendar can be useful, as it serves as a guide to when assignments are due or when tests are coming up. Use a different colored marker for each subject: for example, math projects noted in red, English in blue, and social studies in green. Breaking down long homework projects into manageable blocks on the calendar can make it easier for your child to stay on track. Timing and duration of extramural activities and sports. Homework may need to be started at a different time because your child may participate in after school sports or clubs. However, mark homework start and end times on the calendar after these extracurricular activities. Kids with ADHD often benefit from having breaks every 10 to 20 minutes during homework periods. Give your child a snack break so that he or she doesn't become overwhelmed by long periods of work. Some kids work better on their own in a quiet atmosphere, while others prefer to be able to see what's going on in the household. Try a variety of settings and stick with what works best for your child. The end goal of establishing a homework routine is so that you can begin to step back and allow your child to manage time, set objectives and return work to school on time. Rewards don't have to be toys or special snacks, but can be incentives such as 15 minutes of outdoor play with Mom or Dad or 10 minutes of television time when specific homework assignments are accomplished. 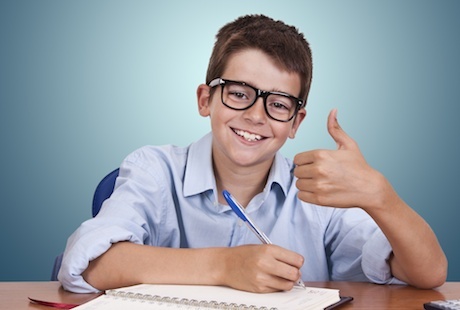 Verbal praise for homework-related tasks goes a long way in boosting self-esteem. For instance, comments such as "Well done, Jack, for bringing home the books and crayons you needed for your homework today" or "Good job, Susan, for getting that crossword all done this afternoon" is great positive reinforcement. When it comes to ADHD and homework, keep the communication lines between yourself, your child and the teacher open and communicate as much as necessary. Help your child by supplying the necessary support tools and establishing routines, and homework success will be within their reach. If you suspect your child has ADHD or has already been diagnosed with ADHD, contact us online or find a center near you to learn more about how the Brain Balance Program can help.